Like many of you, I was unable to attend the Surface Navy Association Conference, but I did find a number of videos which may provide some of the information that would have been available there. The Coast Guard Commandant had been scheduled to speak but cancelled, apparently in response to the partial government shutdown. I have provided three videos, each about ten minutes, that may be of general interest, and links to four others, typically 20-25 minutes. The descriptions are from their respective YouTube pages. The second and third videos have specific Coast Guard content, which I have identified by bold typeface with the beginning time in parenthesis. Some of the other equipment may have Coast Guard applications in the future. Day 2 video coverage at SNA 2019, the Surface Navy Association’s national symposium. Vice Adm. Tom Moore, USN, the commander of the Naval Sea Systems Command, discusses US Navy efforts to increase public and private ship repair capabilities, lessons learned from repairing USS John S. McCain and Fitzgerald, the new Ford-class aircraft carrier, getting the Littoral Combat Ship on regular deployments and more with Defense & Aerospace Report Editor Vago Muradian at the Surface Navy Association annual conference and tradeshow in Northern Virginia. George Awiszus, military marketing director of GE Marine, discusses the outlook for the company’s LM2500 engine that drives warships in more than 30 nations and the future of shipboard power with Defense & Aerospace Report Editor Vago Muradian at the Surface Navy Association’s annual conference and tradeshow in Northern Virginia. Adm. Bill Moran, USN, the vice chief of naval operations, discusses dialogue with China, improving the surface force in the wake of 2017’s deadly accidents, refining Navy culture, increasing ship repair capabilities, harnessing data, improving information sharing across the force and the new Design for Seapower 2.0 with Defense & Aerospace Report Editor Vago Muradian at the Surface Navy Association’s annual conference and tradeshow in Northern Virginia. Maj. Gen. David “Stretch” Coffman, USMC, the US Navy’s director of expeditionary warfare (N95), discusses new expeditionary warfighting concepts, the recent deployment of Littoral Combat Group 1 — composed of USS Wayne E Meyer (DDG-108) and USS Somerset (LPD-25) — to South America, new formations to replace the current Amphibious Ready Group and Marine Expeditionary Unit, unmanned ships, the performance of the F-35B Lightning II and more with Defense & Aerospace Report Editor Vago Muradian. If you were unable to attend the Surface Navy Association Symposium, but would like to see what you missed, NavyRecognition offers a series of videos. They include a number of systems that have been discussed here including, smart projectiles for the 57mm, unmanned surface vehicles, the LRASM Long Range Anti-Ship Missile, SeaRAM as a replacement for Phalanx, TRAPS Towed Reelable Active Passive Sonar, MK20 Mod 1 Electro-Optical Sensor System (EOSS), TRS-3D Baseline D multi-mode radar (MMR) ordered for the ninth NSC. If you want to look primarily at the frigate proposals as well as the proposed weapons modules for the LCS which might also be applicable to the icebreaker, there is this composite video. Incidentally why was there no mention of this symposium on the National Cuttermen Association Chapter, Surface Navy Association website? FLIR Maritime announced recently that it has been awarded a $50 million indefinite delivery, indefinite quantity contract to provide marine electronics systems under the U.S. Coast Guard’s Scalable Integrated Navigation Systems 2 (SINS-2) program over a five-year period providing the purchaser a right to extend delivery for an additional five years. FLIR will provide electronics systems that will be standard fit on over 2,000 U.S. Coast Guard vessels, ranging from small-class boats through large cutter-class vessels. The systems include Raymarine multi-function navigation displays, radars, sonars, remote instrument displays, and autopilots. The growing use of SeaRAM, which has been being fitted to the trimaran Independence Class LCS, has replaced Phalanx on some destroyers and will replace the Mk49 RAM launcher on the mono-hull Freedom Class beginning with LCS-17. It is also expected to be fitted on the follow on LCS derived Frigate as well. If things start to get tense we may see these on NSCs and OPCs as well. The fact that the extended range RAM Block 2 is now operational. The SeaRAM has the same degree of autonomy as Phalanx but because it is a “fire and forget” missile, will be able to engage multiple incoming anti-ship missiles at extended range. 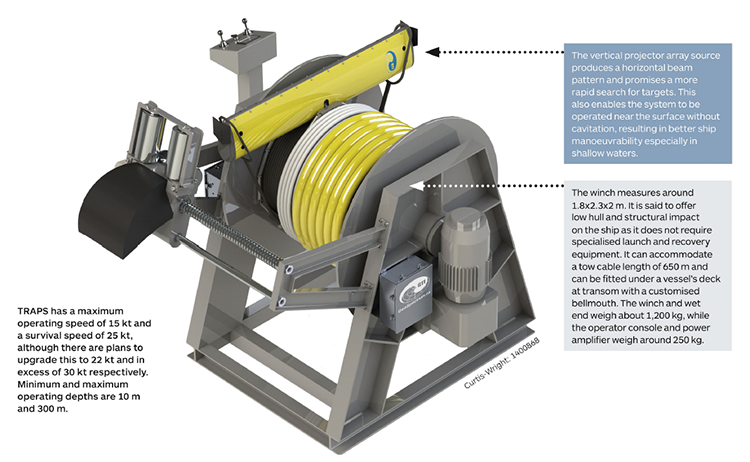 More info on the Curtis-Wright TRAPS containerized active passive towed array which should be able to fit on anything WMEC sized and larger. 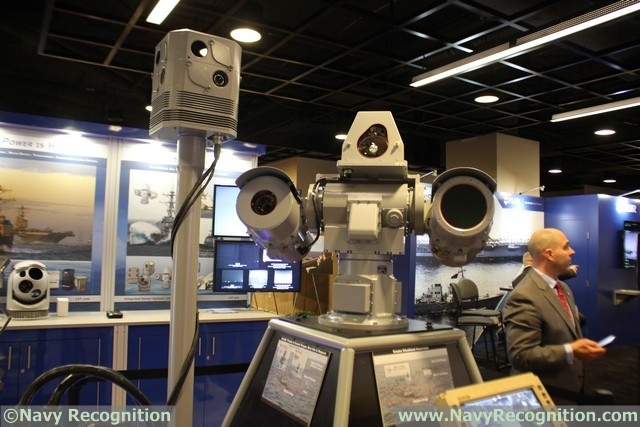 Two reports by NavyRecognition from the Surface Navy Symposium on the L3 Mk20 Mod1 Electro Optic Sensor System (EOSS). The video report above discusses the system from time 00:45 to 2:55, and there is this short written post reporting successful testing. Reportedly this EOSS will weigh half as much as the previous mk20 mod0 system, but have greater resolution and range. According to the report it is currently planned to be installed aboard U.S. Navy Cruisers/Destroyers and U.S. Coast Guard Cutters, presumably the Offshore Patrol Cutters (OPC). The earlier Mk20 Mod0 is on the National Security Cutter. The three parts visible are, I believe, a day light TV camera, a thermal imaging camera, and a laser range finder. I wonder if it could also function as a laser target designator? TRS-3D Baseline D Multi-Mode Radar for 9th NSC. The Bertholf Class have been equipped with the rotating Active Electronically Scanned Array (AESA) TRS-3D multi-mode (air search, surface search, helicopter control, and firecontrol) radars from the first. My understanding is that this is an improved version of the same radar that equips earlier National Security Cutters and the Freedom class LCS. Airbus (formerly EADS) has an excellent multi-paged description of the system here. It is not clear to me how this compares with the TRS-4D system, also from Airbus. The TRS-4D will equip Freedom Class LCS beginning with LCS-17, and I expected it to be used on the Offshore Patrol Cutter (OPC). (Late note: in fact the OPCs will have the SAAB Sea Giraffe multi-mode radar– Chuck) The TRS-4D appears to be very similar in many respects, but it looks at higher elevations and is lighter. Is it a replacement for the TRS-3D or is it a “junior” version of the same technology? This system is seen as a possibility for both the twelve Kingston class “Coastal Defense Vessels” (970 tons, slightly smaller than the 210s) and the projected six icebreaking Arctic Offshore Patrol Ships. There is apparently no intention of using these on the more capable frigates. The system can be fitted in a standard sized 20 foot container. TRAPS in 20 foot iso container. “The modular design of TRAPS provides a variety of installation options, including containerization on multi-mission vessels and standard deck-mounting. A typical detection range of 50 nautical miles is claimed. If it works as advertised this might give most of our larger ships an ASW capability and perhaps help us detect semi-submersibles. Thales’ CAPTAS series is similar, with CAPTAS 2 and CAPTAS 1, designed for ships of over 1,500 and 300 tons respectively.